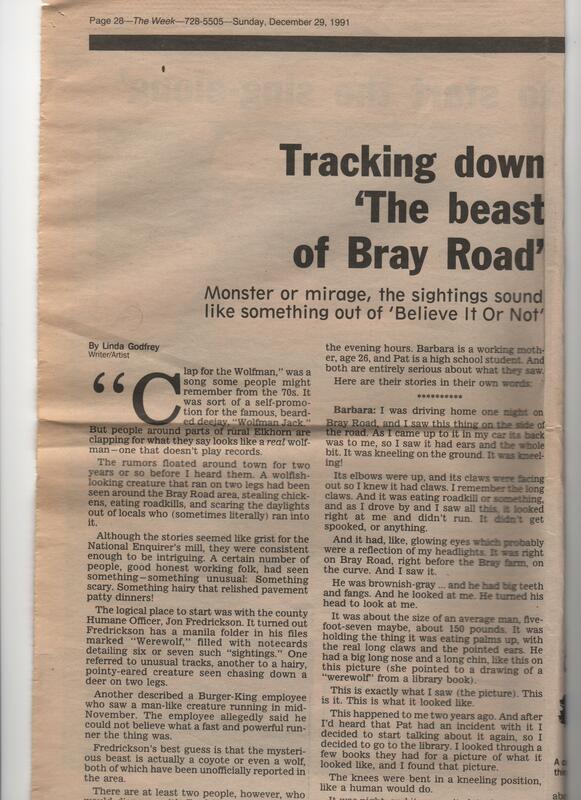 Believe it or not, Thursday was the 20th anniversary of my original news story on the creature I dubbed The Beast of Bray Road. Little did I know what it would lead to! And yes, although similar creatures are reported to me regularly from all over the US, the Beast is still spotted on Bray Road. The most recent credible report was from a middle-aged couple who saw it cross the road near Hwy NN and then easily hop a fence, all on two legs. They said its shaggy fur “flowed” in the wind. My first book on the topic, “The Beast of Bray Road,” is now out of print but can now be had on Kindle (used book copies are quite pricey!) That was published in 2003, and fall 2012 will see my 5th book dealing with unknown, upright wolf-like creatures “Real Wolfmen – True Encounters in Modern America” from Tarcher/Penguin. No one is more surprised than I am at the creature’s longevity. Will there be more? That depends entirely on whether enough new cases come to me or if some truly amazing evidence comes to light. I am starting to wonder if the mystery will ever be solved, but I do intend to keep investigating.